The 2017 Honda Accord is available now at Brilliance Honda of Crystal Lake, and it offers excellent fuel economy along with advanced technology. The Honda Accord EX trim level adds some upscale features that set it apart from the lower level trims. 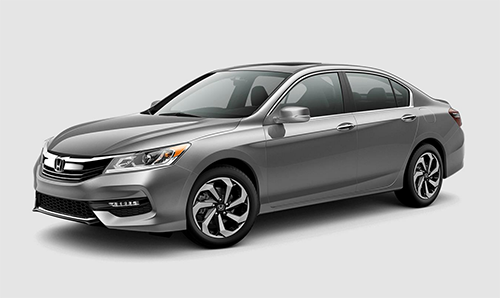 Find out more about this Accord model today, or visit our dealership in Crystal Lake, just a short drive from Elgin, IL. The Accord EX uses a 2.4L four-cylinder engine that produces 185 hp and 181 lb-ft of torque. The Honda Accord EX model can be equipped with either a six-speed manual or a continuously variable transmission. The CVT helps the Accord EX achieve up to 27 mpg city/36 mpg highway in EPA estimates*, while the manual is rated at 23 mpg city/32 mpg highway in EPA estimates*. Here at Brilliance Honda of Crystal Lake, your local Elgin area Honda dealer, we’ve got the current 2017 Honda Accord in stock now. You can visit us here at 680 W. Terra Cotta Ave. in Crystal Lake to find the trim level that fits your needs. You can also contact Brilliance Honda of Crystal Lake online if you have questions about the current Honda Accord today.